When the pressure is on to find the perfect candidate, data-driven recruiting enables you to quickly prioritize and discover the best talent. We are excited to announce that new search insights are now available in LinkedIn Recruiter and Recruiter Professional Services to help you use data to identify quality talent. 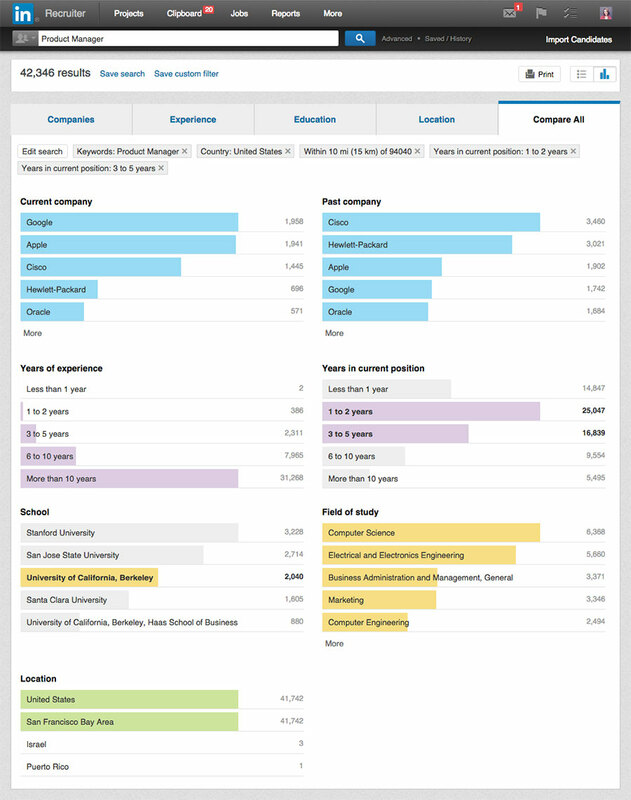 The goal of these new search insights is to help you quickly visualize, analyze, and interpret talent pool data. After you enter your search criteria, search insights will reveal the talent pool’s current and past employers, years of experience, education, and location via intuitive, interactive bar charts. According to a Bersin study, one thing that top recruiters have in common is the ability to analyze and understand talent pools. Yet, LinkedIn data shows that only 1/3 of recruiters say they have access to the tools they need to do this well. With search insights, you can now gain a deeper understanding of the talent market and quickly identify and prioritize the best talent pools to recruit from. Toggle between tabs to see the data behind your search displayed in interactive bar charts. If you have ever dealt with a challenging hiring manager, you are not alone - according to a LinkedIn survey, 82% of recruiters share that their hiring managers can sometimes have unrealistic expectations. Search insights can help you summarize candidate market data to educate your hiring managers about the realities of any given talent pool. These insights will help you and your hiring manager determine, for example, whether you should expand your search to new markets or adjust the compensation or title. “When I was sitting with the hiring manager and looking at LinkedIn Recruiter’s search insights, we immediately knew if we were casting too tight of a net and how we needed to adjust the criteria. It allowed me to talk about how big the market is, and whether the hiring manager needed to adjust his strategy,” remarked Brigitte Kearney, a staffing specialist at Qualcomm who piloted search insights. Deepen your understanding of the candidate market and share these insights with hiring managers. Search insights can also help strengthen your relationship with candidates by enabling you to advise them on current market dynamics. For example, you can share data with candidates to help them understand what experience they will need for a given role, which job markets are most competitive, or who the top employers are for a given talent pool. These insights help you act as a trusted advisor. 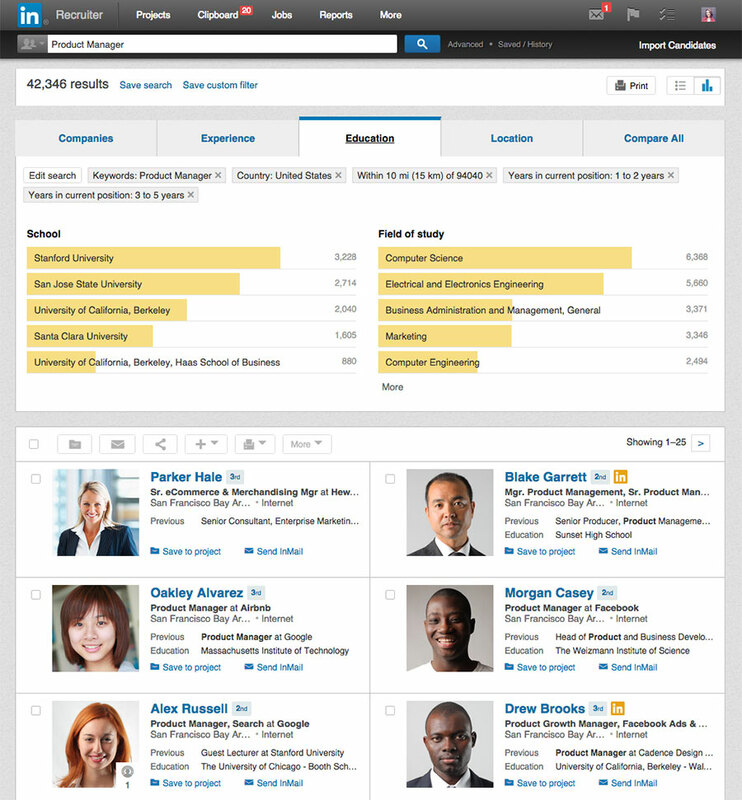 Start using search insights in Recruiter today by clicking on the bar chart icon from your search results page. Learn more about search insights and watch our video tutorial.